Bathe in the beauty of an in-bloom garden full of pink roses with the Nesti Dante Emozioni in Toscana Garden In Bloom Soap. Bursting with elegance and joy, this heady floral scent pampers your skin with delicate rose petals whilst enriching your skin with pure delight. Timeless in its own right, the classic scent of a rose uplifts and romances your senses with its luxury, refined aroma. Authentic and rich, this sumptuous soap is crafted using the original handcrafted technique of saponifcation, this impressive soap is enriched with a pure vegetable base with the purest raw materials. Your skin feels the benefits of lightweight hydration whilst the delicate scent of beautiful rose uplifts and settles your mood. Work into a lather and massage all over your body to cleanse and purify your skin. Store in a cool, dry and protected place to preserve longevity. 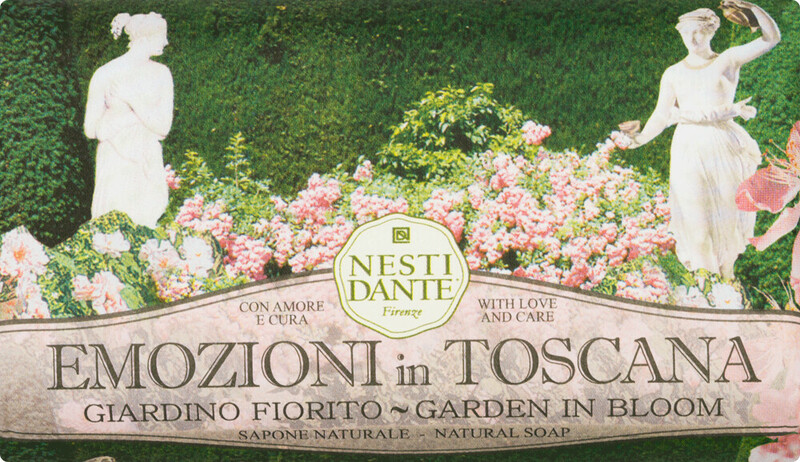 Nesti Dante Emozioni in Toscana Garden In Bloom Soap 250g is rated 5.0 out of 5 by 1. Rated 5 out of 5 by andrex from love a good soap i do love a nice soap. i bought this based on reviews of this brand's soaps- i have not used it yet, but could smell the beautiful fragrance eminating from the packaging when i opened my parcel! they are great value for money for a luxe soap - big size.